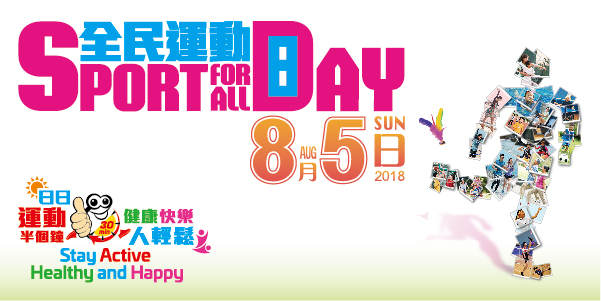 The Leisure and Cultural Services Department (LCSD) will hold the “Sport For All Day 2018” on 5 August 2018 to encourage people of all ages and those with disabilities to maintain a healthy lifestyle by participating in various sports activities and forming the habit of exercising at least half an hour a day. To make “Sport For All Day” a household name and drive home the importance of regular exercise, the event will adopt “Stay Active, Healthy and Happy!” as the slogan. Clear and catchy, the slogan is tailored to remind everybody of the benefits of daily exercise on both the body and the mind, and encourage members of the public to include exercise in their everyday routine. On the day of the event, various recreation and sports programmes will be offered at designated venues in the 18 districts, and most of the leisure facilities of the LCSD will be open for public use, all free of charge.